Ann died. Ann was born. She married Thomas Turner Tongue in 1890. Clara died. Clara was born. Mary Gertrude Tabb was buried at Loudon Park Cemetery, Baltimore, Baltimore County, Maryland. Mary died at Maryland. Mary was born at Virginia in 1859. She married Charles H. Turnbull at Baltimore, Baltimore County, Maryland, on 10 February 1880. Charles was born on 25 January 1858. He married Mary Gertrude Tabb at Baltimore, Baltimore County, Maryland, on 10 February 1880. Charles died on 15 August 1938 at Maryland at age 80. He was buried after 15 August 1938 at Loudon Park Cemetery, Baltimore, Baltimore County, Maryland. [S539] Source: R. Bolling Batte Papers in posession of The Library of Virginia, Richmond, Virginia, biographical Card Files, Tabb, A, Card 111 of 136 (http://198.17.62.51/cgi-bin/drawerIII/disk8/CC/BA/035/T0463). [S337] Source: Miscellaneous Marriage Records Gleaned From Mecklenburg County, VA order Book 5, page 109. [S597] Source: R. Bolling Batte Papers in posession of The Library of Virginia, Richmond, Virginia, biographical Card Files, Tabb, K, Card 52 of 144 (http://198.17.62.51/cgi-bin/drawerIII/disk8/CC/BA/035/T0464). [S491] Source: R. Bolling Batte Papers in posession of The Library of Virginia, Richmond, Virginia, biographical Card Files, Tabb, A, Card 32 of 136 (http://198.17.62.51/cgi-bin/drawerIII/disk8/CC/BA/035/T0463). [S495] Source: R. Bolling Batte Papers in posession of The Library of Virginia, Richmond, Virginia, biographical Card Files, Tabb, A, Card 39 of 107 (http://198.17.62.51/cgi-bin/drawerIII/disk8/CC/BA/021/K0273). [S420] Source: Death Notices From Richmond, Virginia Newspapers 1821-1840, The Virginia Genealogical Society, Special Publication Number 9. [S591] Source: R. Bolling Batte Papers in posession of The Library of Virginia, Richmond, Virginia, biographical Card Files, Goode, M., Card 32 of 148 (http://198.17.62.51/cgi-bin/drawerIII/disk8/CC/BA/016/G0204). William was born at Mecklenburg, Mecklenburg County, Virginia, circa 1765. He married Mary Tabb at Mecklenburg County, Virginia, on 2 September 1798.1 William died on 12 July 1872 at Georgetown, Washington, DC. Elizabeth was born at Mecklenburg County, Virginia, on 25 April 1774.1 She married George Hunt Baskerville at Mecklenburg County, Virginia, on 17 December 1791.2 Elizabeth died on 11 October 1836 at Danville, Virginia, at age 62. [S540] Source: R. Bolling Batte Papers in posession of The Library of Virginia, Richmond, Virginia, biographical Card Files, Tabb, A, Card 112 of 136 (http://198.17.62.51/cgi-bin/drawerIII/disk8/CC/BA/035/T0463). [S565] Source: R. Bolling Batte Papers in posession of The Library of Virginia, Richmond, Virginia, biographical Card Files, Baskerville, Card 25 of 81 (http://198.17.62.51/cgi-bin/drawerIII/disk8/CC/BA/003/B0028). George was born at Mecklenburg County, Virginia, on 18 November 1765. He married Elizabeth Tabb at Mecklenburg County, Virginia, on 17 December 1791.1 George died on 23 February 1811 at Mecklenburg County, Virginia, at age 45. [S561] Source: R. Bolling Batte Papers in posession of The Library of Virginia, Richmond, Virginia, biographical Card Files, Kanipe, Card 25 of 94 (http://198.17.62.51/cgi-bin/drawerIII/disk8/CC/BA/021/K0270). He married Polly Dudley. Ritchie was born at Mathews County, Virginia, in 1760. Ritchie died in 1848. Lewis was born on 28 October 1793. Lewis died on 10 November 1796 at age 3. Kitty was born on 13 October 1795. Kitty died on 10 November 1796 at age 1. William was born on 13 September 1797. William died on 22 January 1827 at age 29. Samuel died. Samuel was born on 30 January 1800. Edward Tabb married Harriet Dixon. Edward was born at Mecklenburg County, Virginia, on 10 February 1802. Edward died on 21 November 1854 at Burke County, Georgia, at age 52. He was buried after 21 November 1854 at Girard, Burke County, Georgia. Armistead was born on 24 January 1804. Armistead died on 1 August 1835 at age 31. Sally was born on 31 December 1805. Sally died on 23 September 1844 at age 38. Tombstone of Rev. Thomas Tabb located in Marion, Alabama. [S343] Source: E-mail provided by Molly Day (e-mail address) to George E. Tabb, Jr. on 26 January 1999. Henry was born at Mecklenburg County, Virginia, on 4 January 1813. He married Sarah Kalb Cannon at Lowndes County, Mississippi, on 31 March 1840.1 Henry died on 26 June 1856 at Lowndes County, Mississippi, at age 43. [S722] Source: Mississippi Marriages From 1829 to 1900 (http://www.familytreemaker.com/_glc_/3547/3547_1.html). 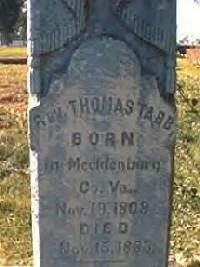 She married Thomas Tabb.1 Mary died. Mary was born. John died. John was born. Mary died. Mary was born. [S401] Source: William & Mary College Quarterly, Vol XIII, 1904-1905, page 124. [S596] Source: R. Bolling Batte Papers in posession of The Library of Virginia, Richmond, Virginia, biographical Card Files, Tabb, K, Card 50 of 144 (http://198.17.62.51/cgi-bin/drawerIII/disk8/CC/BA/035/T0464).